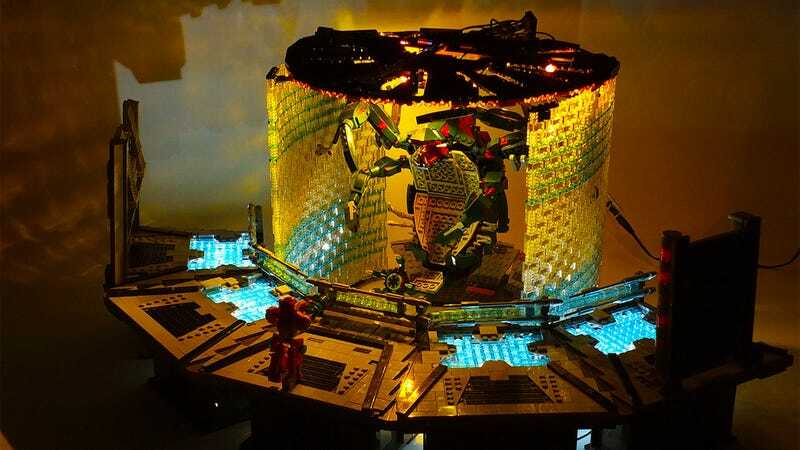 Last year Lego builder and Metroid Prime fan Jared Rosenblitt recreated the exciting battle between the terrifying Meta Ridley and Samus atop the Chozo Artifact Temple. To celebrate the series’ 30th anniversary, Jared hit reset and went back to the beginning of the game. Metroid Prime is one of our favorite games as well, so we dig where Jared is coming from when he painstakingly gatherers clear and translucent blue Lego pieces to craft the rotating shield surrounding the game’s first boss encounter. Check out the shot from the artist’s Flickr page without the fancy lighting applied. For those of you unfamiliar with the fight, here’s a look at the battle, courtesy of YouTube’s Boss Fight Database. The folks at Beyond the Brick caught up with Jared at BrockFair Virginia 2016, where he was showing off his anniversary celebration piece. Once again fans prove that Nintendo makes poor construction toy partner decisions.